A horse or pony with choke will be in an acutely distressed state, coughing, spluttering and struggling to breathe and swallow properly. A prolonged episode of choke can cause scar tissue in the oesophagus and pneumoniacan occur as a result of fluid or feed getting into the lungs during an attack. The waves of contraction in the muscular wall of the horses's oesophagus may only succeed in carrying the food down part way. The contractions may run out of steam somewhere in the lower neck or chest of the horse. Whilst recovering from an episode of choke the horse's diet should mainly consist of a soft gruel fed little and often. Hay and grass should be avoided. 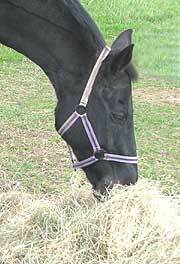 Causes and Treatment of Choke in Horses - an obstruction of the oesophagus of a horse. Symptoms include regurgitated food and saliva coming from the horse's nostrils,coughing and gasping.